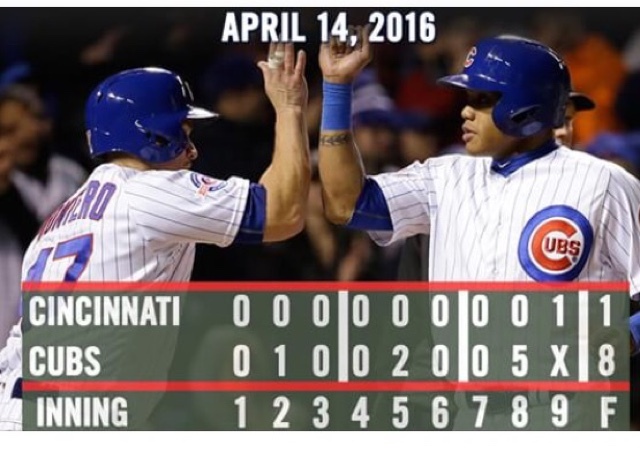 Cubs beat the Reds, 8-1, to complete the three-game sweep! They're off to their best start since 1969. Jason Hammel picked up the win and an RBI, Dexter "You Go, We Go" Fowler reached base in four of five plate appearances, and Kris Bryant homered for the second consecutive game. The first place Cubs host the Rockies this weekend at Wrigley. How about putting the standings on the web site? At least the Cub's division. Great call! Done, effective with post 147. Go Cubs!